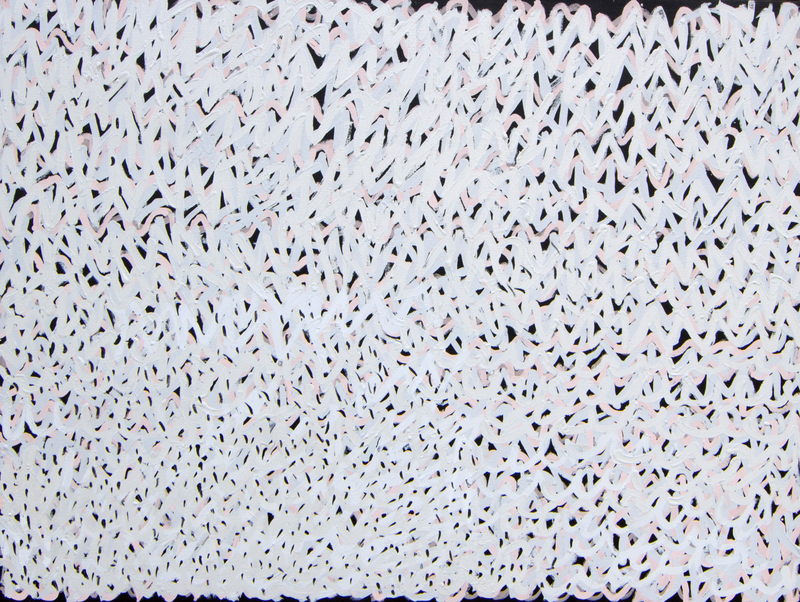 In association with Waringarri Aboriginal Arts, we are delighted to present our first solo exhibition by Kittey Malarvie, Before and After. 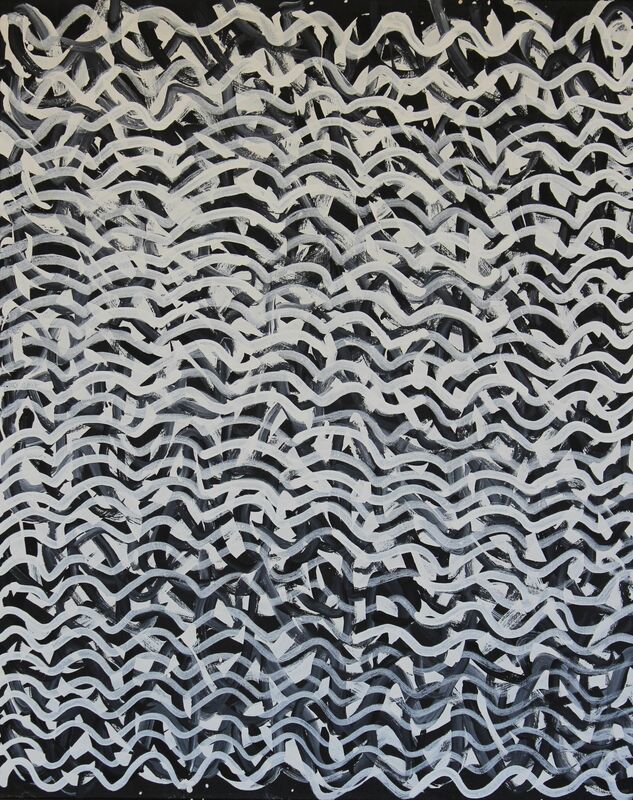 The exhibition title links Malarvie's two main themes, Milkwater and Luga, to the cycle of rain and its evaporation, as well as to her childhood memories that are embedded in each canvas. 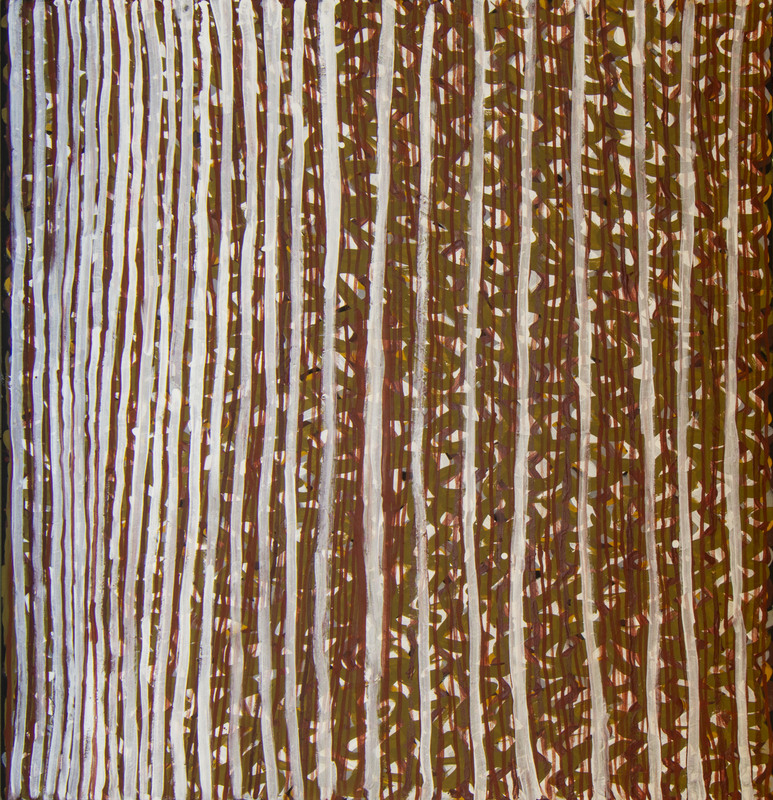 Malarvie's Milkwater series references the reflection of light and wind off the milky water that flows through the creeks after the rains. The layers of wavy lines that traverse her canvas track her traditional country around Sturt Creek, south west of Kununurra, Western Australia. 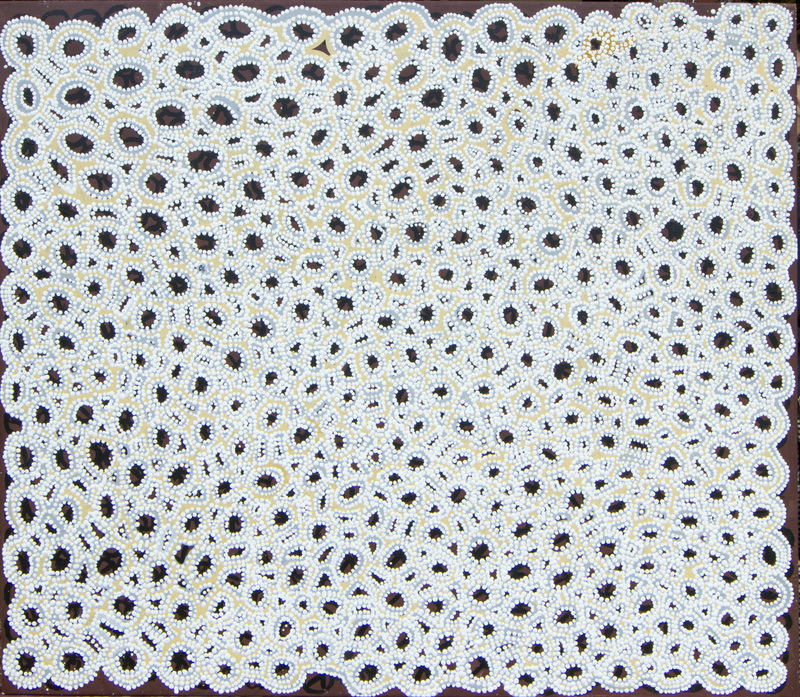 For Malarvie, they evoke memories of the water lapping the creek banks as the beds gradually dry out. The Luga series depicts the cracking mud that appears as the water recedes. The mudflats where Malarvie played as a child were called Luga (pronouced 'Looka'). These are happy memories for Malarvie of making mud cakes and playing a game like stepping stones with her sisters and young cousins. The mud contains salt, so the elders would sometimes eat it as a form of bush medicine. 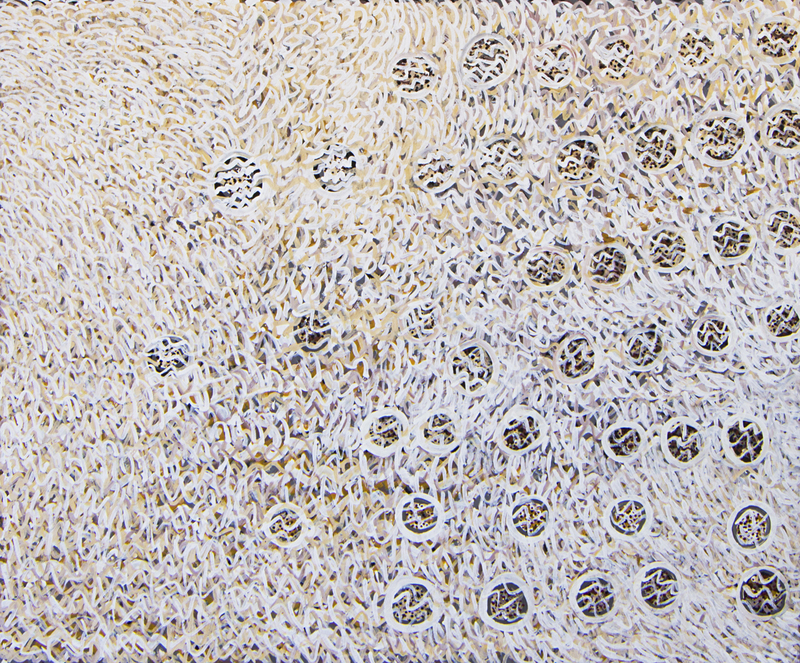 There are also two works from her Goongoolong series which show the sap of the bloodwood gum. The sap is an important ingredient in bush medicine remedies. Boiled in water and drunk, it is used as a blood tonic. Malarvie says that some people use it for cancer treatment, too. Taken together, these paintings are a collection of Malarvie's past and present. In her telling of the stories, there is a sense of nostalgia for the time when all of her family was together living a traditional life out bush; a longing for the quiet, pure and timeless beauty of the bush before the Europeans came. These are her stories of nature and nurture, of clan and culture, of then and now. Her use of ochres and natural pigments embody the substance of her living memories, which give us an insight to an incredible wisdom and way of being that we are rapidly losing touch with as technology increasingly mediates our every waking moment. 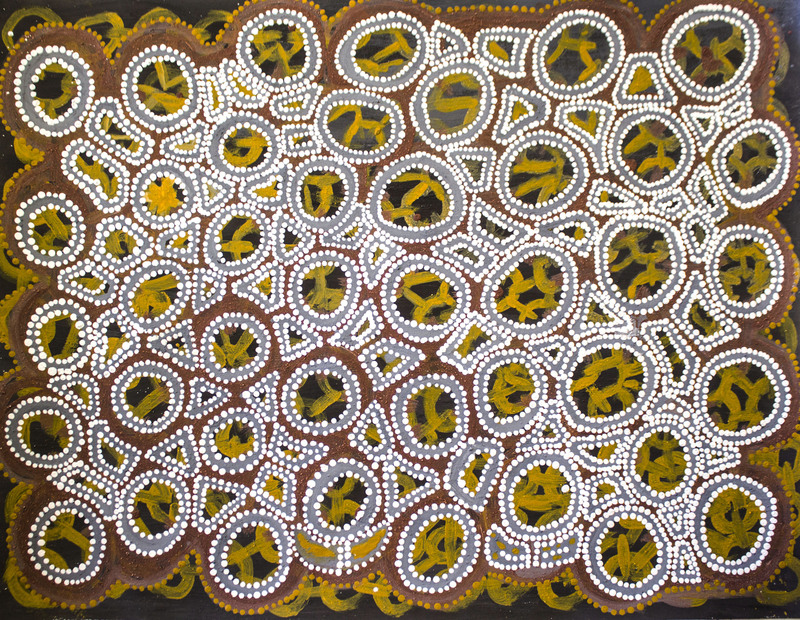 COLLECTIONS: Kittey Ngyalgarri Malarvie is represented in several public and corporate collections, including National Gallery of Australia, Art Gallery of Western Australia, Nevada Museum of Art USA, Wesfarmers Collection, Zhongfu Group Collection China. 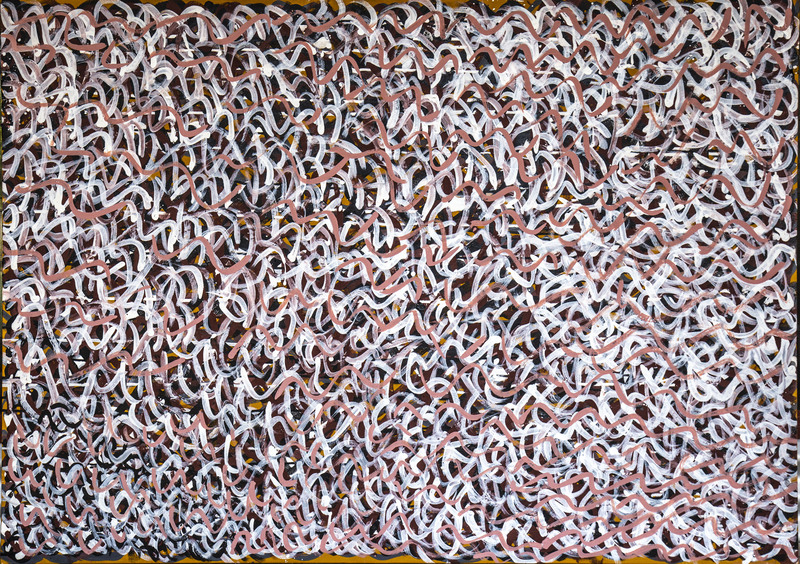 natural ochre and pigment on canvas, 150 x 180 cm. natural pigment on canvas, 100 x 140 cm. 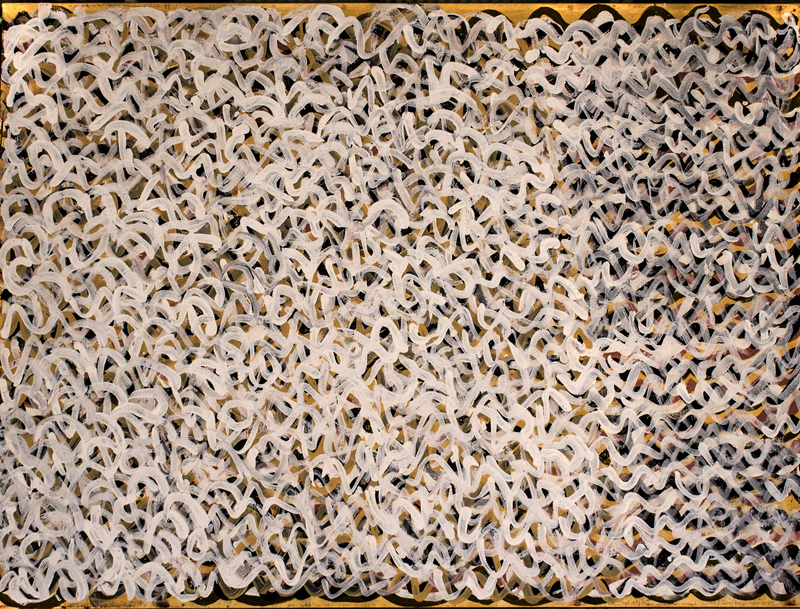 natural ochre and pigment on canvas, 90 x 120 cm. 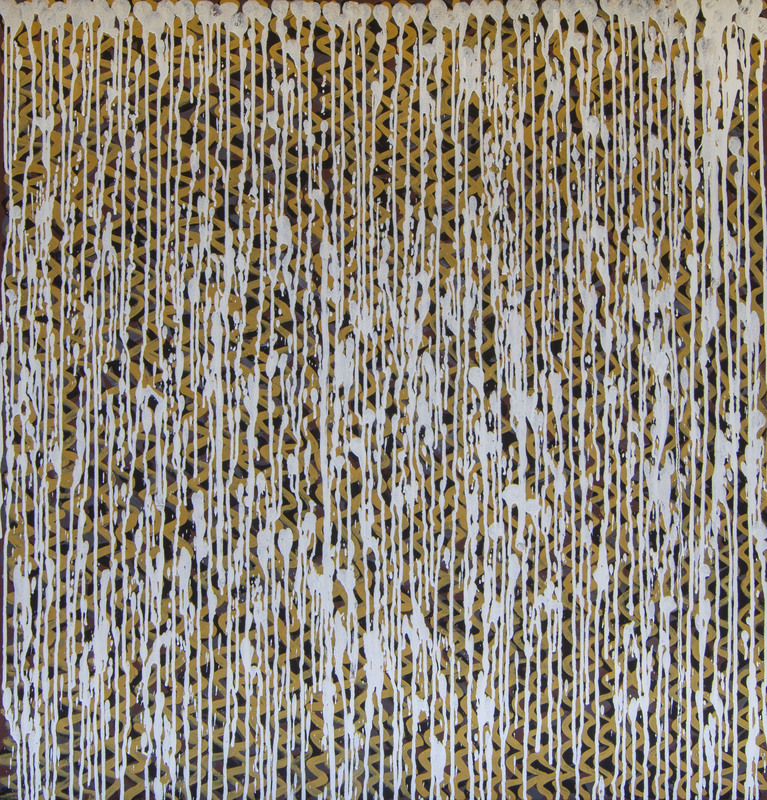 natural ochre on canvas, 80 x 100 cm. natural ochre on canvas, 100 x 80 cm. natural ochre and pigments on canvas, 60 x 80 cm. natural pigment on canvas, 60 x 60 cm. natural ochre pigments on canvas, 105 x 120 cm. 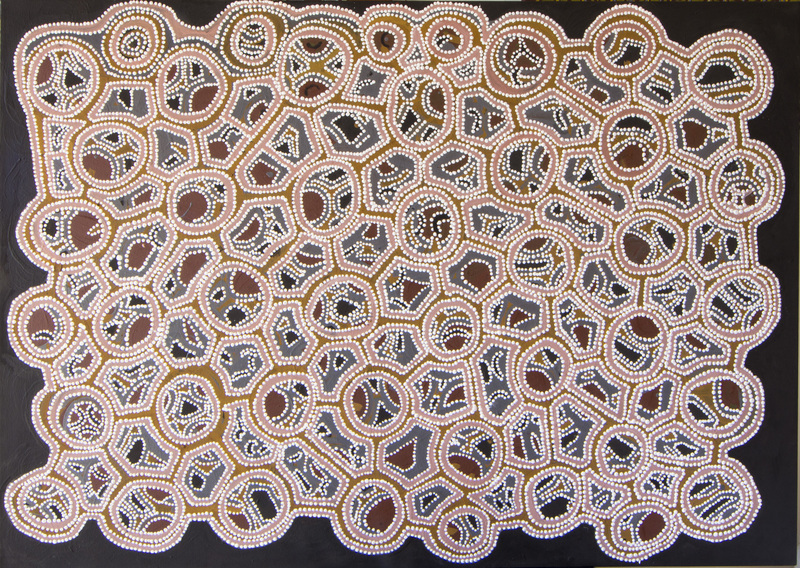 natural ochre and pigment on canvas, 120 x 90 cm. 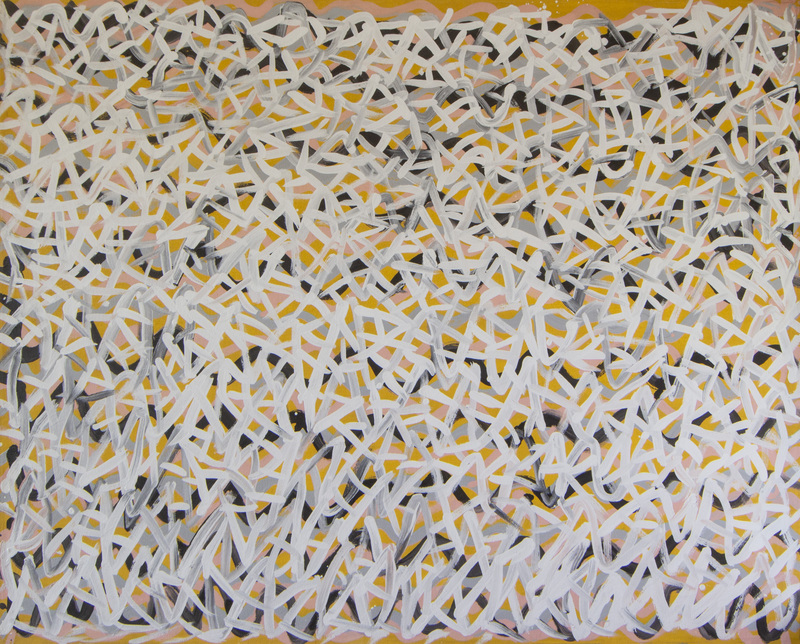 natural ochre on paper, 64.5 x 83 cm. natural pigment on canvas, 125 x 120 cm. 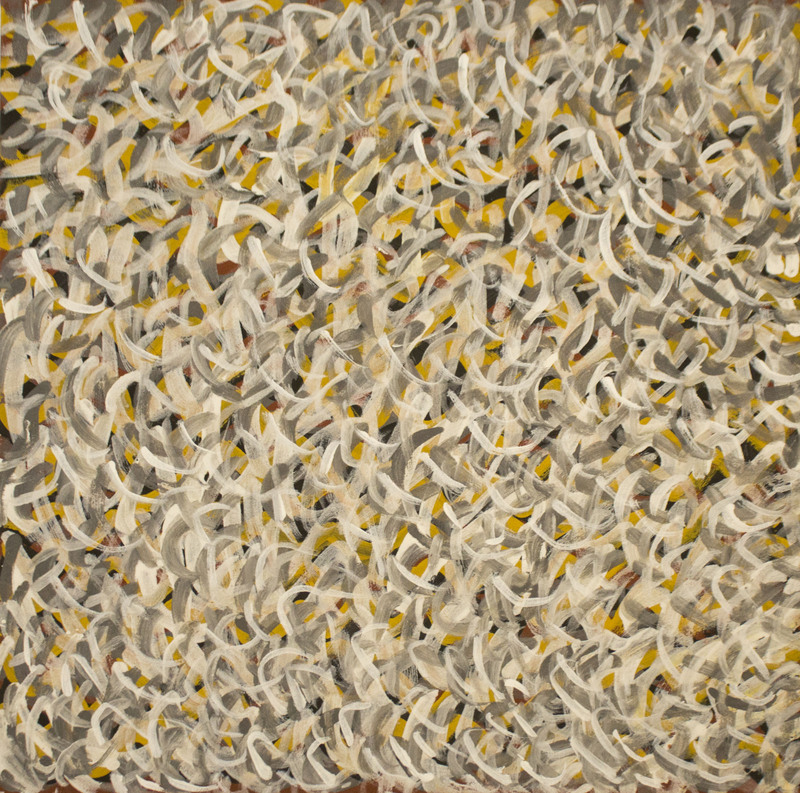 natural ochre and pigment on canvas, 130 x 125 cm.